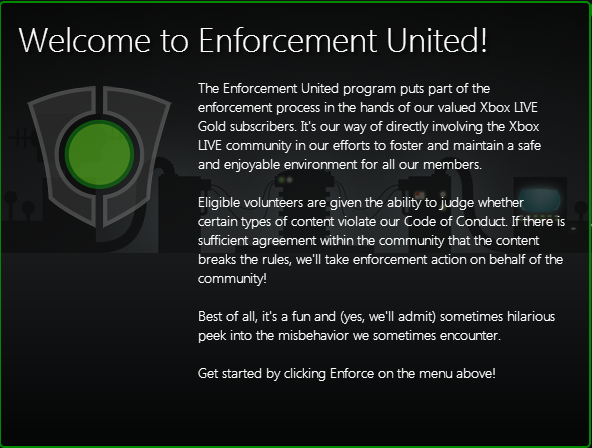 Microsoft has started to roll out the Enforcement United Beta program for Xbox LIVE Ambassadors who meet Xbox LIVE Gold subscription, Gold tenure, gamerscore, and age requirements. Users who volunteer for the program are involved in “efforts to foster and maintain a safe and enjoyable environment” for all members. These volunteers are tasked with determining if “certain types of content” violate Code of Conduct. If “sufficient agreement within the community” deems that the content is against the rules, Microsoft pledges that they will “take enforcement action on behalf of the community”. 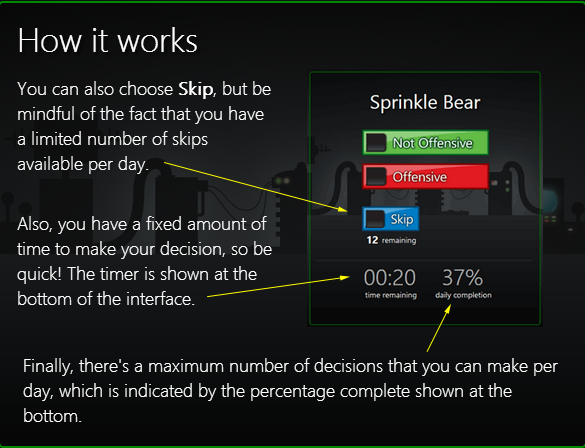 The whistle-blowing process is fairly simple: the volunteer’s browser populates a small field that provides a gamertag, two boxes for “Not Offensive” or “Offensive” rating, a fixed timer, a daily completion percentage, and a Skip box that can only be used a limited number of times. In choosing “Offensive”, Enforcers presumably flag a gamertag for the aforementioned followup that may result in “enforcement action”. 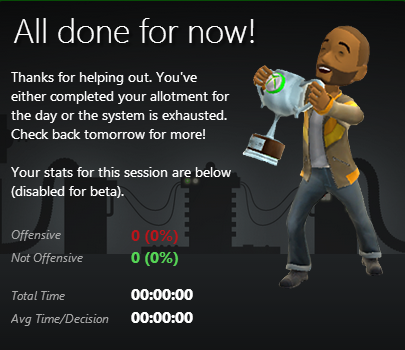 Though only gamertags are being evaluated at the moment, Microsoft’s identifier of “certain types of content” is vague enough to leave the door open for future expansion of the project.